As early as the 1970s, Pyrocontrole was already involved in the manufacture of temperature sensors for the nuclear industry and that involvement has continued to grow ever since. Our sensors, qualified to withstand the most extreme conditions in terms of irradiation, earthquake, temperature and pressure, enable you measure the temperatures in your installations as reliably as possible in all circumstances. 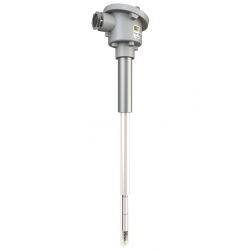 Our K1, K2, K3 and NC-qualified temperature sensors are installed on the REP 900 MW, 1300 MW and N4 Series and in third-generation EPR power plants. Qualified to withstand the most extreme conditions (irradiation, earthquake, high temperatures, high pressures, etc. ), our sensors are positioned at all the strategic points in a nuclear installation. >Applications: from the reactor building to the machine sets, as well as in the auxiliary buildings, our experts have designed a range of sensors equipped with reliable, innovative technologies. as well as in the safety pumps and lift pumps. in the primary loop, even when there are rapid variations. from the pressurizer to the machine sets. These measure the temperature at the bottom of the pool.